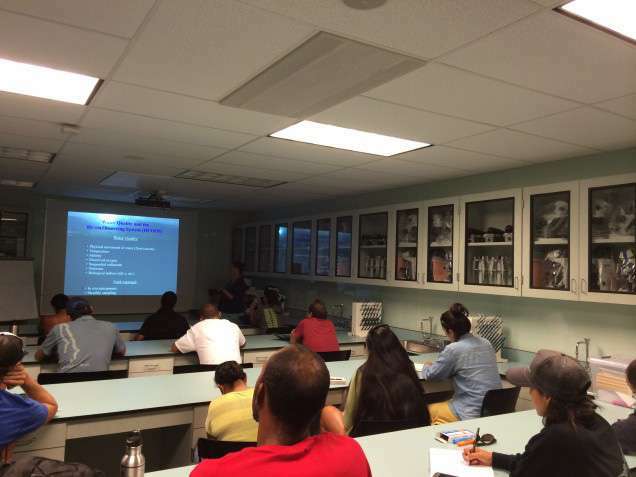 On September 15 and 16, a water quality training workshop was offered for Hui Mālama Loko I‘a. The workshop was jointly organized by KUA (with support from Pacific Aquaculture & Coastal Resources Center and University of Hawaii Sea Grant College Program) and Alu Like, Inc. KUA has been facilitating the Hui since 2013, and Alu Like, Inc. is another non-profit organization that specifically supports the Loko Ea Fishpond through its Maritime Stewardship Program. This workshop was the first training opportunity specifically organized to serve the community of fishpond practitioners, and there were 13 participants from fishponds on O‘ahu, Moloka‘i, and Hawai‘i. Water quality monitoring is an important aspect of management for loko i‘a, yet many fishpond stewardship groups lack the technical knowledge as well as the resources and capacity needed to develop monitoring programs. This training offered an initial overview of water quality, as well as a venue to discuss opportunities to coordinate equipment, data, and ideas between fishpond groups. Attendees also learned about a developing effort to provide access to YSI Professional Plus Multiparameter instruments that were secured thru a grant from the Western Pacific Regional Fisheries Management Council. The first day of the workshop was hosted at Oceanic Institute. 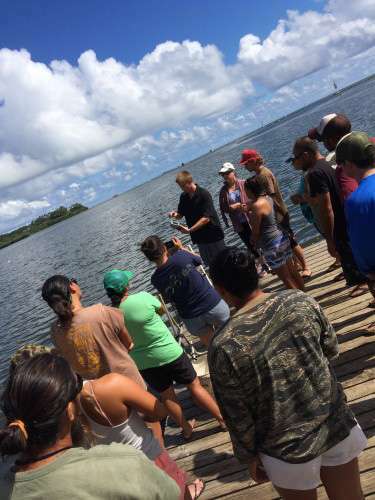 The lab space provided a unique teaching environment for the workshop’s teaching partners to discuss water quality parameters and also share their ongoing research from He‘eia fishpond. The teaching partners included members of the University of Hawai‘i Department of Oceanography: Kathleen Ruttenburg (Associate Professor), Rosie Alegado (Assistant Professor), Gordon Walker (Oceanographer – Pacific Islands Ocean Observing System), and Margaret McManus (Professor/ Associate Chair). Workshop participants also had the opportunity to learn from Chad Callan (Research Scientist & Affiliate Faculty of Oceanic Institute) and Carly Cappelluzzo (Hawaii Pacific University Marine Science Graduate Student) about the mullet broodstock project that operates at Oceanic Institute, in partnership with three fishponds – He‘eia, Loko Ea, and Keawanui. 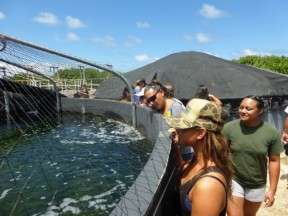 The second day of the workshop was hosted by Paepae o He‘eia (POH) at He‘eia Fishpond. 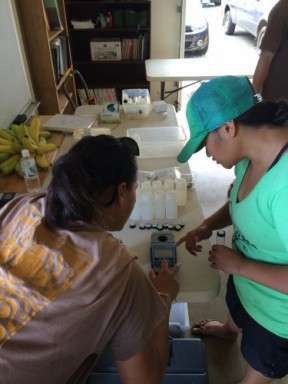 Participants learned more about water quality monitoring equipment and techniques from University of Hawai‘i undergraduate students Brandon D’Andrea and Camilla Tognacchini. POH staff Kinohi Pizarro, Keahi Pi‘iohia, and Keli‘i Kotubetey also shared their water quality monitoring protocol for the broodstock project and discussed future monitoring requirements for a restoration project on the kuapā (fishpond wall). The workshop concluded with an open discussion about the many different applications and contexts for water quality in loko i‘a. Overall, the event was an opportunity for us to become more knowledgeable about loko i‘a environments, and affirm the diverse lenses through which we can learn about them…qualitative and quantitative, traditional and contemporary, local and global, micro and macro, etc etc etc! It was also a time to discuss ways to support each other and create stronger connections to the partners that we have within the research communities at Oceanic Institute, Hawai‘i Pacific University, University of Hawai‘i, and PacIOOS. Mahalo nui to everyone who participated and helped to make it happen!! This entry was posted in Hui Mālama Loko I'a and tagged HuiMalamaLokoIa. Bookmark the permalink. Mahalo for reaching out and reminding us of the assistance and resources you can provide! Thank you so much for including us and having us not only share info but you helped us gain focus on why we are doing it and what it all means. Mahalo nui! One of the best parts was having you guys share what you’re doing. I hope we can create more opportunities for others to share in the same way! Great stuff Brenda! Awesome to read, we’ve just finished another exciting project here, too… will post about it soon and link to you. Mauriora. Tina. Mahalo Tina! Excited to hear more about your work. Just started following your blog too! Mālama.